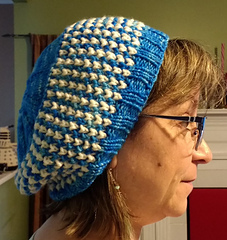 Fits head size 22" - 24"
This fun slouchy hat is a great way to use up small amounts of left over yarn from other projects. 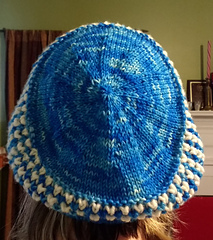 This is Hat #3 in the 12 Hats of Christmas KAL being hosted on the Criminal Knits…for the Serial Knitter in all of us. Group. Come join us for all the fun! 2 colors of worsted weight yarn. MC approx. 50 grams, CC approx. 30 grams. Be sure your choices are high contrast. Note: to make the hat taller you will need a little more of both colors. Fits head size: 22” - 24” The hat is 8” high from brim to crown of head, but is easily made taller by working more of the 2-color pattern rows.